The company I work for uses an old Wowza server (version 3 for EC2 3.1.2 build 1624) to handle some RTMP recording and streaming. 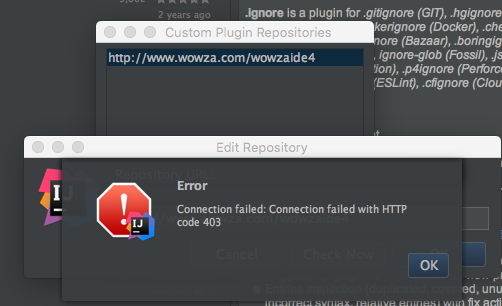 However, when I attempt to add http://www.wowza.com/wowzaide4 or /wowzaide2 to my repo list, I get a 403. Same when attempting to visit in the browser. All the other links to these files I've found on Google are no longer valid. Does this much show for you? Oh, I should have mentioned that I am using IntelliJ IDEA, not Eclipse. From Googling I found other people doing this successfully and it has the same repo setup so I hoped that part would work. I've attached a screenshot of what I see. Is there a way I could just download the relevant files directly? We've submitted the request to our Engineering team with a request for Intellij. Thank you for the feedback. At present, we only provide a package for Eclipse. We do not have anything prepackaged for Intellij at this point. I will send this to our backlog team for review but there is no timeframe for integration. Thank you - it is not possible to get the IDE files through other means?